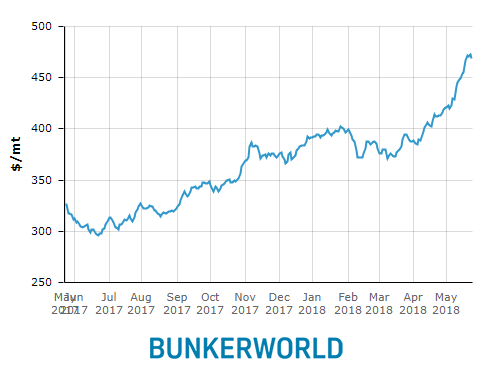 “The increase in bunker price in 2018 has been significantly higher than what had been expected and has now reached a level of 440 USD/ton in Europe, the highest since 2014,” the company said in a customer advisory. As informed, the increase is more than 20 pct higher when compared to the beginning of 2018. Maersk Line said that due to the unexpected development it was no longer possible for the company to recover bunker costs through the standard bunker adjustment factors. As such the EBS will be applicable to all cargo globally, effective June 1 2018 for non-Federal Maritime Commission (FMC) corridors and July 1, 2018 for FMC corridors, the company added.